This monthly “write-in” is a great way to hone your writing skills, embrace the benefits of free-writing, write that story you’ve always wanted to write, and set aside a time to write ….your blog posts, your poems, the start of your book …..all the while sipping on a craft beer/cider/wine to spur your creativity! For those who might be hesitant or who discover writer’s block in the moment, we will have a writing topic/exercise that you will be able to write about if nothing else is coming to you! Our format will be 25-10-25-10. We write for twenty five minutes, talk for 10, then repeat! If people want to stay beyond this time, for writing, connecting and having pints together, everyone is welcome to do so! This group meets monthly. While this group is casual and relaxed, we do want people to have the space and time to write so we will get quickly settled in and then get to writing right off the bat. Please arrive early to get a beer and food! This group is to motivate, inspire like-minded people to put pen to paper or fingers to the keyboard to write those stories who’ve always wanted to get into the world! And it’s a great way to meet others who love to write and get the inspiration you need to get to Write-In! 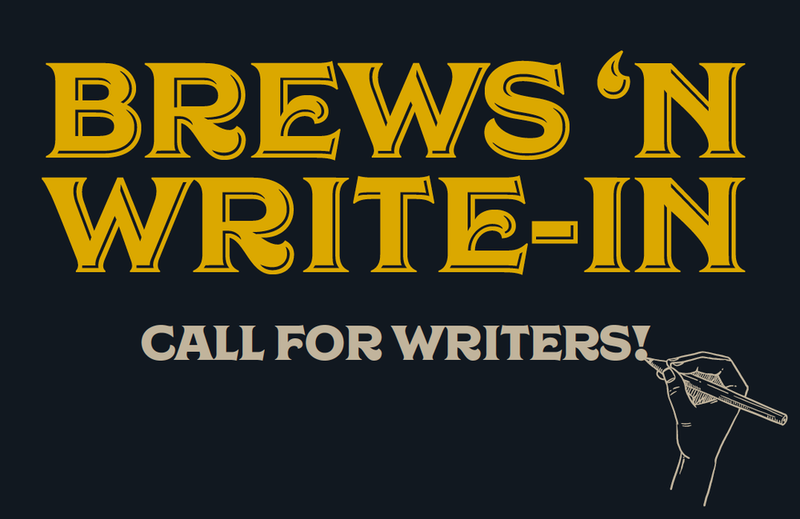 We hope you will join us for our Brews 'N Write-In!